Who was Pablo Fanque? The story behind the Beatles' Being for the Benefit of Mr Kite. Beatles Radio: The Beatles, Solos, Covers, Birthdays, News The Fab 4 and More! It was 20 years ago today Sergeant Pepper taught the band to play and it will be 50 years ago this year that the Beatles first recorded their epic concept album Sgt. Pepper's Lonely Hearts Club Band. Among the many classics on the album, one of the most intriguing and haunting is the dreamy, psychedelic Being for the Benefit of Mr Kite, which promises a "production second to none" on trampolines, with "somersets through hoops and garters and hogsheads of REAL FIRE" and with dancing by a colourful cast of characters, including the talented Mr Kite, the Hendersons and Henry the waltzing horse. The story behind the song is even more curious and astonishing. 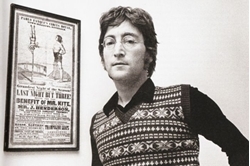 On 31 January that year, John Lennon walked into a Sevenoaks antique shop where a poster advertising a February 1843 benefit for Mr Kite — "celebrated somerset thrower, wire dancers, vaulter, rider etc etc", pictured balancing on his head on a 12-foot-tall pole, playing a trumpet, of course — by Pablo Fanque's Circus Royal caught his eye. Lennon bought the poster, took it home, put it above his piano and, a little over two weeks later, he'd written what he insisted was correctly called Being for the Benefit of Mr Kite. "Everything in the song is from the poster," Lennon later said. "Except the horse wasn't called Henry, it was called Zanthus." But who was the celebrated Mr K? Or the trampolining, somersaulting Hendersons?